A photo essay captures the biennial meeting of Sigma Nu’s supreme governing body. Curt Menefee’s (Coe) voice fills our living rooms every Sunday in the fall as we sit down to watch our favorite NFL teams. 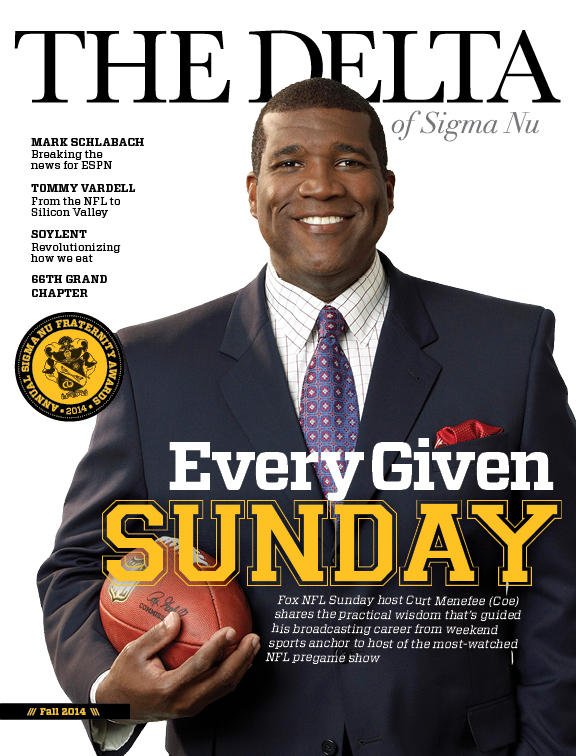 As he begins his ninth year as host of the most-watched NFL pregame show, Brother Menefee shares with us the practical path that has guided his broadcasting career. ESPN columnist Mark Schlabach (Georgia) talks about landing the biggest scoop of the 2010 college football season and the sequence of events that led him to a career in journalism. He’s played for legendary coaches and blocked for Hall of Fame running backs. Now, in his role as managing director of a Bay Area investment firm, Tommy Vardell (Stanford) offers up the keys to leadership and building successful teams. Georgia Tech Sigma Nus Rob Rhinehart and Matt Cauble could be on the cusp of revolutionizing how the world gets its nutrition. News from the General Fraternity office in Lexington. News and notes from alumni around the country. Full list of brothers, chapters and Greek movement leaders who exemplified excellence this biennium. What a new book by Simon Sinek can teach us about leadership and creating positive group chemistry. Plus the latest titles by Sigma Nu authors. Updates on trends in higher education. Grand Historian Bob McCully offers a look at the effort to restore some of Sigma Nu’s most cherished historical artifacts. 2013 Chapter Advisor of the Year Dr. Mark Himmelein (Mount Union) talks advising, leadership, and the importance of listening to students. If you prefer to read the print edition as a .pdf we have made a copy available here. To opt in to start receiving the print copy in your mailbox, complete the short web form available here.